Q: How should I control flow in an air operated double diaphragm (AODD) pump? A: Technically, you have two options: You can regulate the air supply or throttle the discharge. However, when given the choice, the preferred method would be to regulate the air supply. Throttling the discharge requires the pump to generate more pressure than it needs to, stressing the pump. An exception is when the pump is running at extremely low discharge pressure, which may necessitate throttling the discharge line to achieve the desired level of control. Q: Does a pump that uses more air volume also use more energy? A: Not necessarily. This is only true if air pressure remains the same. But by only considering air volume in your calculation of energy consumption, you may be missing an influential factor. Consider this: a pump operating at high pressure and low air volume can consume equal energy to a pump operating at low pressure and high air volume. This is demonstrated through the following electrical equation, with pressure = volts, air volume = amperage, and energy = work. As you can see, it is possible to operate a pump with more air volume without requiring more energy. In this case, the pump using less air volume is consuming just as much energy as the pump using more air volume because it operates at higher pressure. Q: How do AODD pumps measure up to other types of pumps when it comes to efficiency? A: There have been many discussions recently about whether or not AODD pumps are efficient to operate. While AODD pumps have a reputation for higher operating costs than most electrically driven pumps, the reality is not so cut and dry. 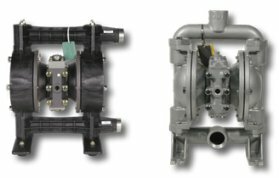 It’s true that a 2” AODD pump will use a lot more energy to move liquid from point A to point B than its electrically driven counterpart, but AODD pumps that are 1” in size or smaller are actually more efficient than electric pumps of similar size and flow rate when considering overall energy costs. There are other contributing factors that support this logic when considering application variables. Intermittent (non-continuous) service usually cancels out any operating cost disparity between air operated and electric pumps because electrically driven pumps have to constantly use energy to stop and start again. Additionally, other positive displacement pumps can have up to 10x the maintenance costs because of issues with deadheading and dry run. AODD pumps do not lose pumping efficiency until there is a complete failure of the pump, where as other pump types will lose efficiency over time due to the wearing of parts such as lobes, rotors, seals, etc.